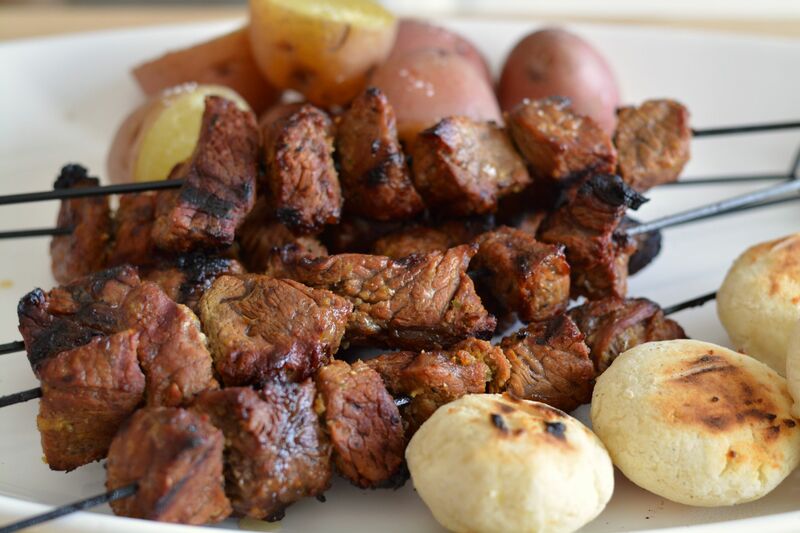 In Colombia we love to eat grilled meat, especially grilled beef, so it’s no surprise that one of my favorite treats as a kid was eating a “chuzo de carne” or a beef kabob with an arepa and a Premio, which is a strawberry flavored soda. That’s why I loved going out on family field trips because I knew that the chances of me having one of those chuzos was pretty good. The sad part was that most of the time they weren’t made with the best kind of meat, to save money, I’m sure, so I would end up with a tough piece of beef, but I didn’t care! 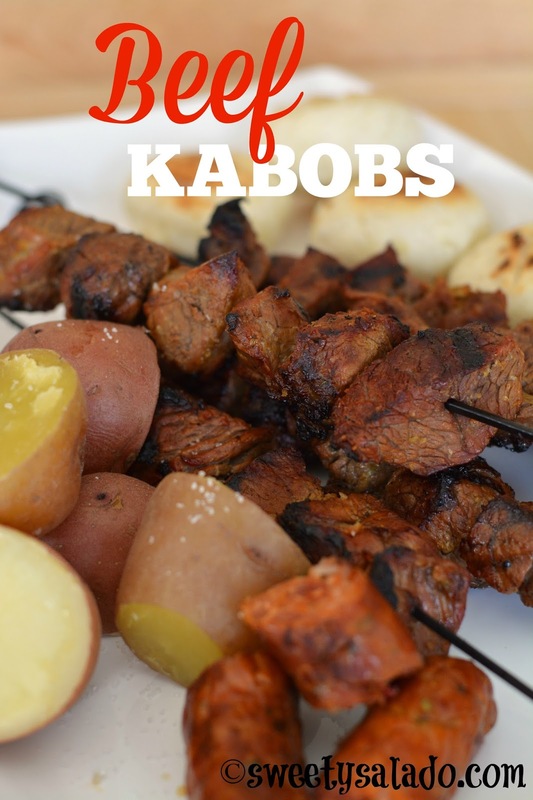 I know that here in the US, kabobs are usually also made with chunks of peppers, onions and sometimes mushrooms and believe me, I love making them that way, not only because they add lots of flavor to the meat but also because the beautiful colors make for a very nice presentation. But not in Colombia, they only serve them with papa salada (salted potatoes) and arepas, or at least that’s the way they used to make them when I was a kid. There are many, many different marinades you can use to make these chuzos and they usually vary from person to person. However, the one ingredient they all have in common is beer. It not only adds lots flavor but it’s also a great way to tenderize your meat. I personally use different recipes to marinate my meat which are all great and my plan is to eventually share each one on the blog. So stay tuned! In the meantime, please enjoy the one I’m sharing with you today which is absolutely wonderful! In a food processor or blender, blend all ingredients (except the beef) to make the marinade. Place the beef chunks in a resealable bag, pour in the marinade and seal the bag. Massage well to make sure the beef is well coated and let it rest in the refrigerator for at least 4 hours, preferably overnight. Thread the beef onto the skewers. If you're using wooden skewers, make sure to soak them in water for at least 30 minutes before grilling to avoid burning. 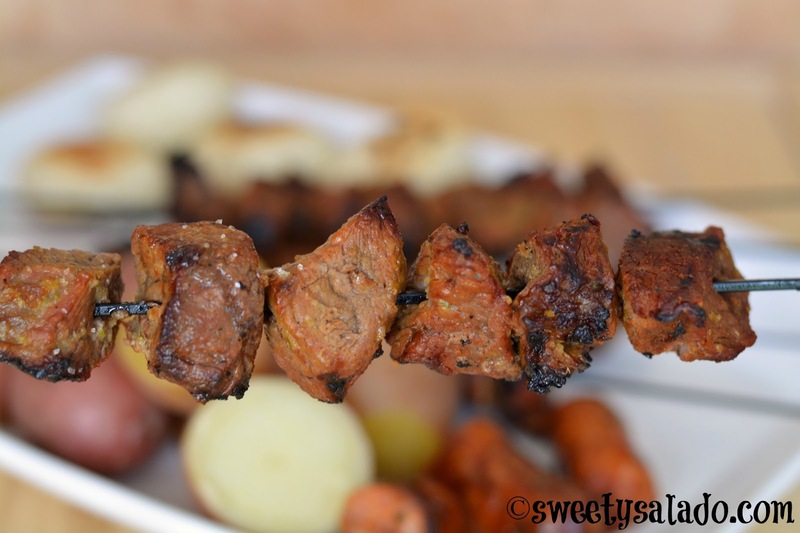 Grill the kabobs on medium high heat for 8-12 minutes turning them every 2-3 minutes so that all sides are grilled. Serve with papa salada (salted potatoes), arepas, Colombian hot sauce, guacamole or chimichurri.